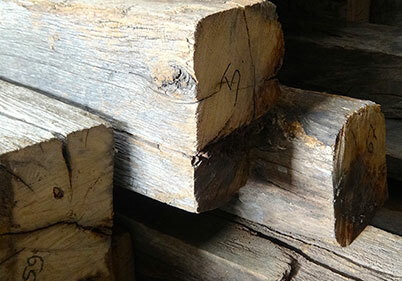 An example of the story and provenance from one of our reclaimed buildings from the Industrial Forests of Europe. When this barn was discovered, the well preserved inscription above the main doors still clearly showed the monogram of the initial owner and the year the barn was built, 1880. Given its significant dimensions it remained functional, used by locals, despite years of wear and fatigue after decades of use. The barn, which was left abandoned by the actual owner for many years is now part of an exciting and beautiful conversion project. Much of the internal timber has been salvaged, reclaimed and re-milled into beautiful French Oak timber beams, joists and Baltic Pine flooring and wall cladding ready to be reused in new development projects. A wonderful piece of 19th Century Victorian architectural heritage has been saved for future generations. This barn was located just south of the beautiful city of Toulouse situated in the southern hills of France, on the banks of the river, only 100 km away from the Spanish border. The Place du Capitole is the city centre of Toulouse, a picturesque and cosmopolitan area. The Place du Capitole is an impressive building with an imposing façade, the Capitole, marks the very heart of the 'Ville rose' (Pink city). Today the Place du Capitale houses the town hall and the Théâtre du Capitole. Its vast square is brought to life by the markets that take place there in the mornings. The main market is called the marché biologique du Capitole, which is a famous market which sells a vast array of organic produce. The square also hosts large crowds that meet on the terraces’ of Toulouse's best-known cafés; Bibent, Grand Café de l'Opéra, Florida and Mon Caf'. Surrounding the square are colourful streets with their own picturesque settings of town houses, fountains, pretty squares, museums and churches, representing this old part of the city as an interesting insight into its rich and vivid past.